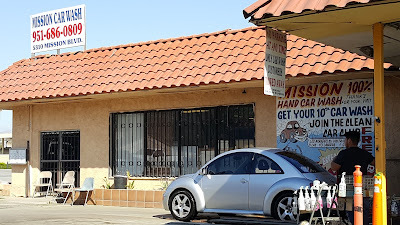 We were ready to roll over to the dump station around 9:30 am.....our "JELLO" plan was to be done dumping around 10 am, and then make a leisurely drive up to the Fontana/Rialto Elks Lodge to pick up my Elks Membership renewal card for 2017-2018.....my current card expires 4/1/2017 and without the renewal we would be denied access to RV sites at Elks Lodges on our trek up the coast......little did we know how important it was that we got that card before we left town! True to plan we were exiting the park just before 10 am......we followed Crestmore up to Mission Blvd where we turned left heading west to Rubidoux Blvd. where we turned right (north) intending to merge on to SR-60 over to the northbound I-215 to the westbound I-10 exiting at Cedar to drive up to the Elks Lodge. 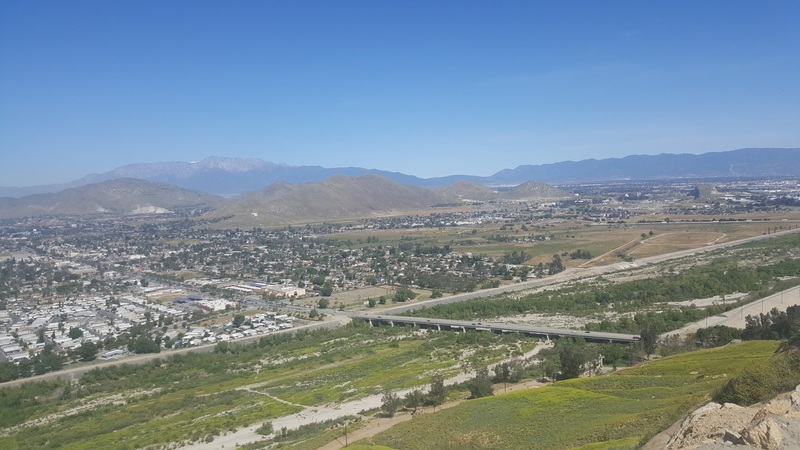 As I turned on my turn signal to turn right on to SR-60 I had this feeling that I should just drive Rubidoux north (it eventually becomes Cedar). 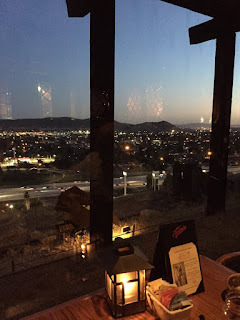 Even though it is a shorter distance driving Rubidoux it actually takes way longer than the longer freeway route. 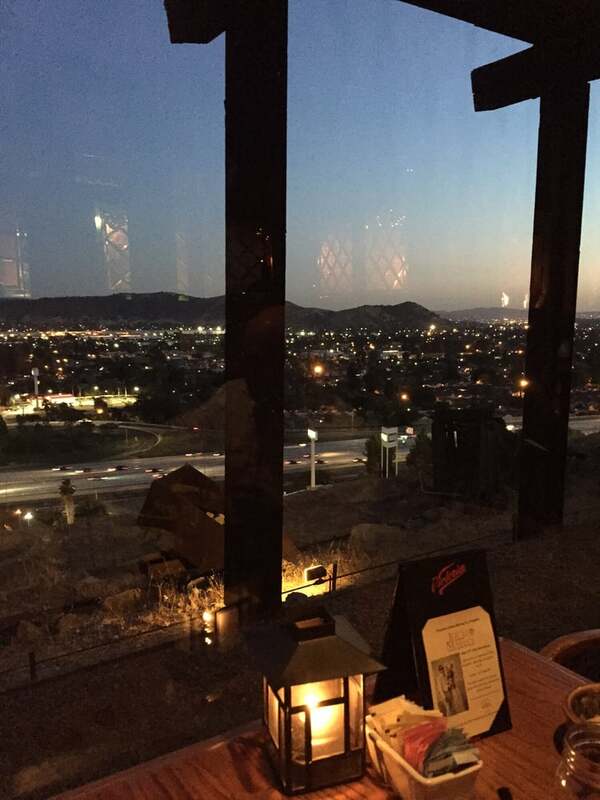 I followed my instinct, turned off my turn signal and continued northward on Rubidoux. About 10 minutes and a few miles later I happened to glance down at the temp gauge for the coolant....usually it is running around 180-185º F......I did a double take as the temp reading was well over 220º F and climbing fast......Detroit Diesel series 92 engines do not like to overheat, and I was fast approaching the automatic shutdown temp of 250º F.......the engine turns itself off and you are stuck where you are stuck.....I had to pull over quick and shut her down to avoid catastrophic damage and being stuck in the middle of a major road. 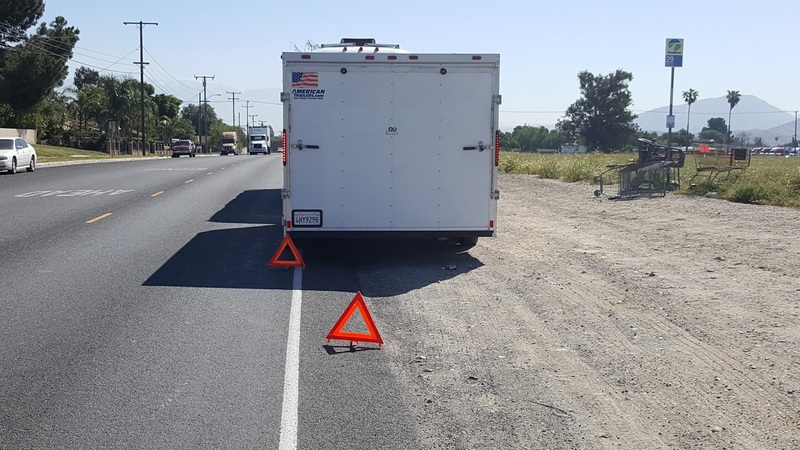 We were approaching a side street called Santa Ana and I could see there was a dirt shoulder about 100 feet down so I turned right, pulled on to the shoulder making sure my entire 62' was off the road and shut her down. Had we been on the freeway when this happened we would have on the shoulder with traffic whizzing by probably having to be towed off the freeway....instead. we found ourselves on a quiet side street able to take our time solving our problem. When you own one of these behemoths you are always wondering in the back of your mind when it's your turn to have a major breakdown. You do everything you can to prevent it, but sometimes in spite of your best efforts and intentions the unexpected catches up with you and there you are on the side of the road wondering what happens next, and will it cost you 5 figures. 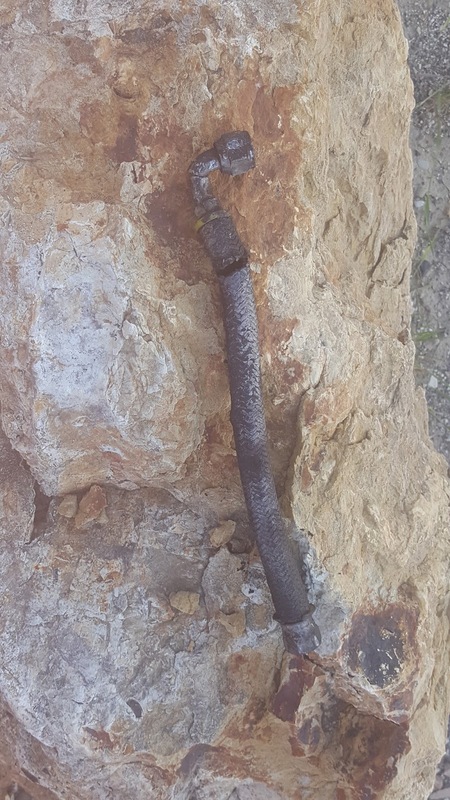 .......the hose in question is about 12 inches long and has custom steel fittings on each end to screw it into place.....okay, at least I know there is a leak, and where it is coming from....that's half the diagnostic battle.....no more guessing. Now, what do I do? Well, first things first....turn on the hazard lights, and get out my cool triangle reflectors....you know, the kind you always see behind broken down semi trucks on the side of the road? Then I go back inside, pull out my Good Sam ERS card and call the '800' number.....Robert answers my cry for help and takes down all my information.....he knows exactly where I am based on data he is getting from my phone GPS. He asks good questions, and then talks with his RV tech guy to verify that they should dispatch a mobile diesel mechanic which he agrees to do. He will text me the information and approximate ETA of the mechanic shortly. Well, shortly turns into 65 minutes.....I finally call back and am reconnected with Robert.....he is having difficulty getting a mobile mechanic to come to us......either it's an RV and they don't work on RV's, or it's a very old RV, or they are booked up until late afternoon, etc. I encourage him to continue his search and then hang up and begin talking with TLE about what we should do. .......I race back to the coach where TLE is waiting, give her the car to drive up to the Elks Lodge to get my membership card, and get to work re-installing the new custom made hose....it took less than 15 minutes. Now my next problem......I need to add coolant to the radiator before I even think about starting it again. I have no idea how much coolant I've lost, but I do carry about 4 gallons of coolant with me at all times, so I get it out and start pouring it into the massive radiator....remember, this radiator holds 23 GALLONS of coolant. I begin pouring in one gallon after another sticking my finger in the radiator after each gallon to see if I can feel the coolant.....after 4 gallons I can not feel the coolant yet. Now, during all of this I did receive a call from a mobile mechanic who could be there in 90 minutes. I told him I had things under control, but would call him back to let him know if we still needed his services. 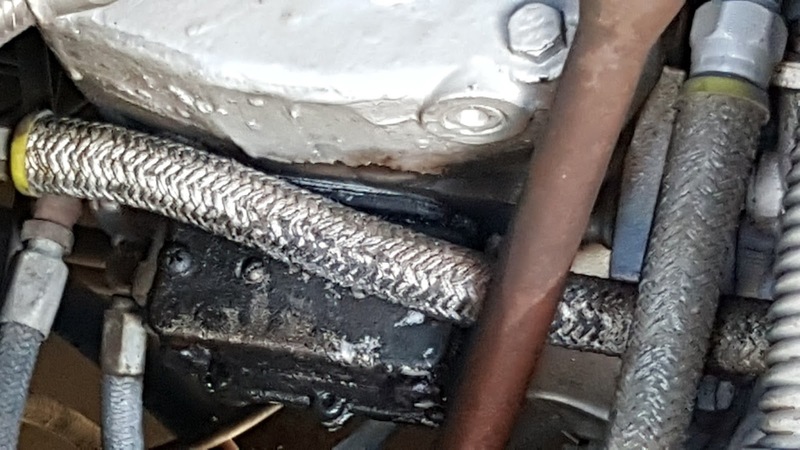 So I called him (Justin) to find out if he could bring coolant to me, and he answers in the affirmative, but says they charge $30 a gallon...why don't I just top off the radiator with water and then go and have it changed out for coolant at my convenience......of course! I have 150 gallons of fresh water in my fresh water tank so I thank him and then begin to fill the empty gallon coolant jugs with water from my tank......in all I had to add 10 gallons.....4 gallons of 50/50 coolant, and 6 gallons of water to top off the radiator. While I am finishing that TLE returns with the Elks membership renewal card.....I go inside and turn over the DD and then go back outside to see if anything is leaking.....nothing is leaking.....then I go back inside and watch the temp gauge......all is normal.....it comes up to operating temperature and stays there....we are tentatively good to go. We put the car back in the trailer, pick up our triangle hazard reflectors....it is now 2:15 pm......we stopped at 10:15 am.....we should already be at Rincon Parkway getting ready to watch a sunset, but instead we are getting on I-10 at the beginning of rush hour in SoCal.....our ETA for Rincon Parkway is 5:10 pm. Now, I have to make a comment about my mental state at this point.....I never panicked, or got negative, or down.....I just began problem solving and dealt with each thing that came my way. Normally I would look at the time and say "We're done for today.....let's just go back to Rancho Jurupa for another night and try again tomorrow", but I was totally sanguine about just continuing up to Rincon Parkway which is about 145 miles away at this point, and we head off westward hoping for the best.....I say that, because we had hoped to get there early enough in the afternoon to snag a spot....the weather in Ventura has been great for the past two weeks, and I am sure Rincon will be packed. 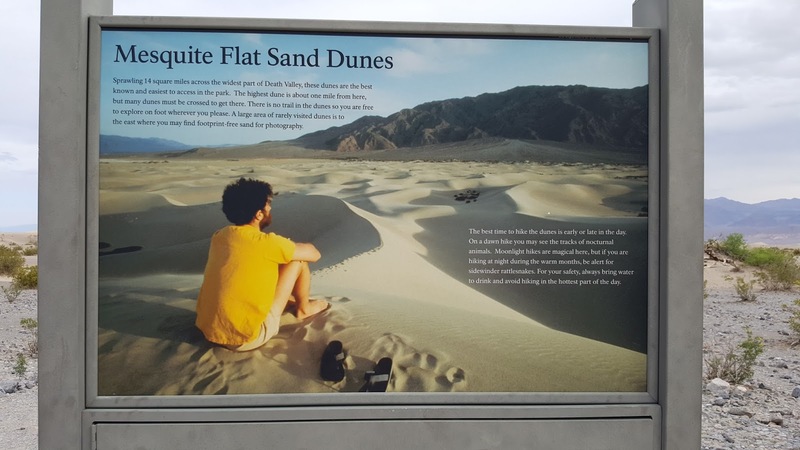 So, we exit SR-101 at the Seacliff exit at just 5 pm, and begin to meander southward towards Rincon Parkway where they have 107 dry camping sites right next to the ocean.......we suddenly realize every single site is taken......EVERY SINGLE SITE! Well, there goes the Jello.....what is our plan B? We find a place to park next to the ocean and TLE and I begin contacting RV parks and State Parks in the area only to find everything is booked.....why you might ask? Well, silly us, we forgot this is 'Spring Break' season in SoCal and there is 'NO ROOM AT THE INN' if you will. I begin calling Elks Lodges....Santa Barbara, no room.....finally I reach the camp host at the Lompoc Elks Lodge and she says they have plenty of sites....come on up! So, we make a u-turn and head back to get on the freeway northbound to Lompoc just 76 miles away! Of course, now you might think the rest is a downhill run, but it was not.....I managed to enter the wrong freeway entrance and find myself on 101 going south, not north.....we have to drive 10 miles to the next exit to get back on 101 going north......it is now 6:20 pm, and sundown is at 7:20 pm....we are going to arrive after dark in a strange town and it is windy.....30 mph plus as we edge northward. I remain calm, but I am tired and ready for the day to be over. Around 7 pm I turn on my marker lights and running lights for the first time in a few years.....we never drive after dark. Well, we arrive at the actually very nice Lompoc Elks Lodge about 7:50 pm.....the parking area and RV sites are very well lit....we are met by the camp host, Lydia. 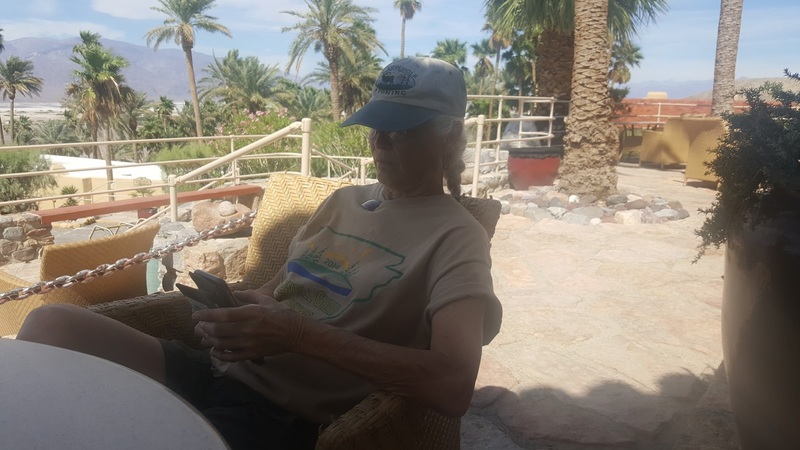 She is very sweet and understanding and lets me drop my trailer in the back in site right next to our site.....there is only one other RV in the park, so she doesn't charge me for the site in which we park the trailer....our cost....$15/night for 30 amp and water....there is a dump station. By 8:10 pm we are backed into our sites, and dialing in the DirecTV......TLE is making dinner while I am hooking up our utilities, and lighting the water heater......all is good in the world.....we close our curtains and we are 'home'. 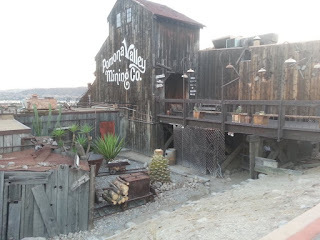 We begin to talk excitedly about what Miss Serendipity has gifted us......we are in a place we would not normally have chosen to visit, but are just a few miles from Solvang, as well as some great local wineries. 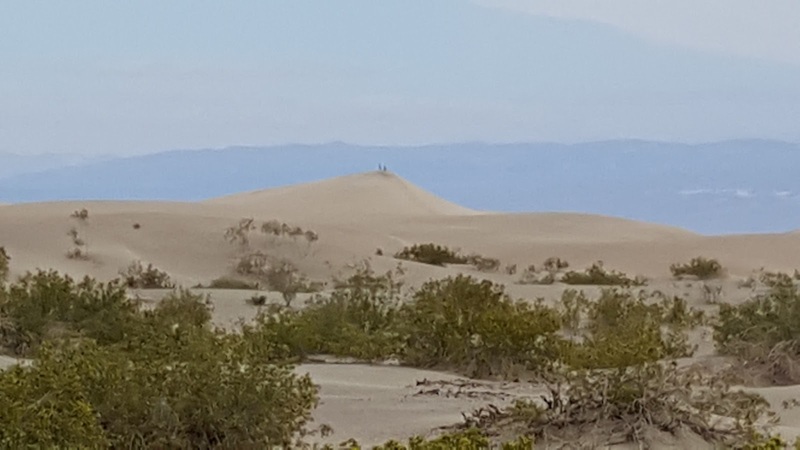 We decide we will stay in Lompoc for at least 3 days, if not longer.....from here we will head up to the Elks Lodge in Oceano.....next door to another of our favorite beach communities....Pismo Beach. Thank goodness for Elks Lodges during 'Spring Break'. We appreciate every purchase made clicking on this Amazon Affiliate link! 7:34 am - PDST - Thursday - 53º F, humidity 67%, wind 1 mph out of the east.......blue, cloudless skies.....much cooler than Wednesday! Today we roll our wheels northward to Ventura and a week right next to the Pacific Ocean on Ricon Parkway, one of our favorite, all time dry camping spots! 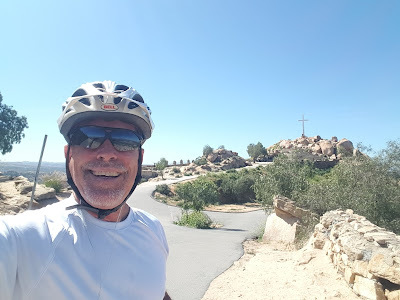 ......I reached the top, took a couple of pix and then began the plunge back to street level.....as I merged on to the SART* again I decided to ride south a few miles before making the turn around to head back to Rancho Jurupa Regional Park. I arrived back just before 12 pm to find TLE doing her daily weigh in, so I joined her.....great news! I am now officially under 200 lbs again.....199.3! I'm not going to give out numbers on TLE, but suffice it to say she is maintaining her weight loss, and within a few lbs. of reaching her short term goal. Once I took a shower we jumped into the VW to head over to my son's office for one last mail run.....I had one package, but the much awaited letter from our Elk's Lodge with my membership renewal card in it had not arrived so I looks like we'll be making a stop at the Lodge on our way out of town. The secretary told me that if we had not received the card by Thursday she would issue another when she comes into the office at 11 am.....it's just a few blocks off our travel route to Ventura so it's all good! We were back home by 3 pm, and we were both beginning the task of putting stuff away (stow the patio awning, put away the awning mats, solar lights, sun screen, straighten up the trailer for VW insertion, etc.). It always takes me a couple of hours with a break thrown in here and there to get it all done, but I've got it down to a 'science' and it all goes pretty smoothly. Most people who look in the trailer when I am using it for my 'man cave' have a difficult time believing the VW actually fits in there, and, frankly, I don't blame them for their skepticism. I finally finished.....well mostly.....around 5 pm and took a short break before getting dressed to go out to dinner with my son Tim, his fiance Laila.....we always meet them at least once each time we are in town at Pepito's Mexican Restaurant.....it's kind of 'our place'. We arrived a little after 6 pm, and they about 2 minutes later......they are always on time, or early....I love punctual people!! We had a lovely 90 minute dinner.....all too short......before it was time to say our 'until next times'......their wedding date is just a few days over 6 months away, and we are so looking forward to it! We watched the current episode of 'Survivor', and then a recorded episode of the latest 'Bering Sea Gold' before heading off to dreamland around 10 pm......now, time to get ready to roll! 7:04 am - PDST - Wednesday - 56º F, 42% humidity, wind 6 mph out of the east southeast.......clear blue skies.....projected high for today is 87º F.....a warm one! We were on our way back across town by 11:30 making a quick stop at my son's office to see if we had any new mail, then down to the local Costco to pick up some of our favorite coffee beans, and some Fagé yogurt for TLE, then it was back up to Arrow Highway and eastward to the Fontana/Rialto Elks lodge to check on our membership card renewal which is due 4/1/2017.....we will need that card when we begin our journey north along the California coast to stay at Elks Lodges along the way. Unfortunately, our membership renewal card was mailed out late last week, so we hope it will be at my son's office Wednesday as we are leaving Thursday for Ventura. We were back home by 2:30 pm and beginning to think about putting stuff away for our Thursday morning departure. About 4 pm TLE said she was concerned our 'black water' tank was full.....it (the toilet) makes a certain sound when you flush it when the black tank is almost full. I'm thinking "How can that be?" as it has only been 6 days since we dumped.....at any rate she asked me to go out and check, so I did.....not only was the black tank full, but so was the gray water tank! 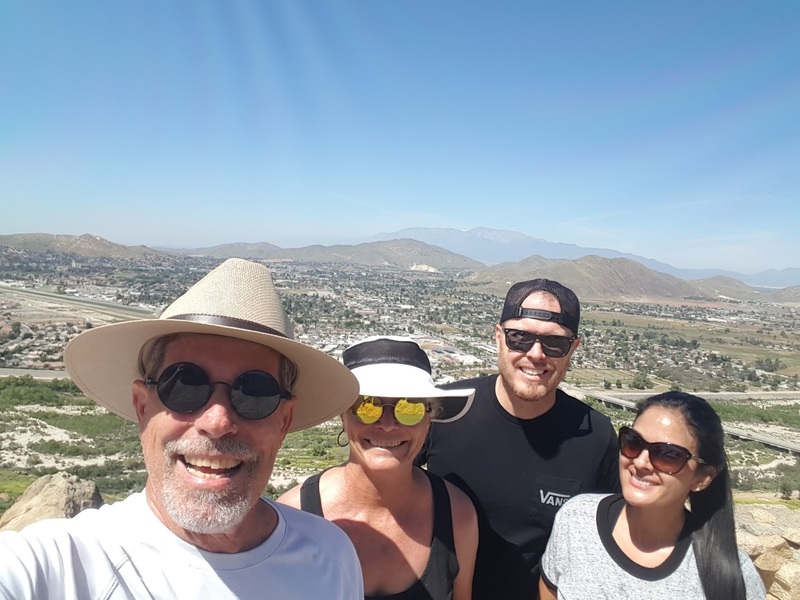 I am standing there trying to figure out how that happened, when it occurs to me that we have been using our RO* water purification system since we arrived at Rancho Jurupa. Suddenly a light goes on......we have no sewer connection.....an RO* system creates 1-2 gallons of 'waste' water for every gallon purified, which is why we don't use it when we have no sewer hookup.....the gray water tank filled up and overflowed into the black water tank filling it to capacity.....doh! For whatever reason we had a collective 'brain fart' after almost two months of no sewer hookups and made a mistake. So, here we are with sundown approaching and we need to unhook, drive over to the dump station and dump both our tanks......sigh. It took us about 30 minutes start to finish and we were back in our site feeling silly about our mistake. We watched a few episodic programs on prime time TV and were in bed by 11 pm.....thanks for stopping by! 7:02 am - PDST - Tuesday - 54º F, humidity 54%, wind 3 mph out of the north.....clear blue skies.....big winds were forecast, but have not materialized in the magnitude they were forecast to be......thankfully! We are getting a few gusts of wind periodically, but nothing like we expected. We haven't had the tandem out for a ride since Borrego Springs so I suggested to TLE that Monday we should take a tandem ride north on the SART* into San Bernardino to a little Subway store to which we have ridden numerous times over the past few years.....it's a great out and back ride with a Subway footlong Club sandwich thrown in for good measure. Before that could happen I needed to give TLE's Cannondale road bike a tuneup and thorough deep cleaning as I had just done to my Bad Boy. That took about 90 minutes to accomplish, then it was time to get out the Cannondale tandem, check the air pressure in her tires, and get her ready to ride. The forecast high for Monday was in the high 60's, and by the time we began our ride it was still quite cool with a little breeze thrown in for good measure, and the sun was making occasional appearances through the partly cloudy skies. I love riding the SART* on first Saturdays (Mondays) as there are not as many people as on the weekend.....you might see another bicyclist every 5-10 minutes, and that was the case on this first Saturday. A little side note for those newer readers of my blog about the term '1st Saturday'.......I have not used the term 'first Saturday' in a long time, so you might be wondering to what I am referring. So, you know that wonderful feeling you get when you wake up on a Saturday morning thinking, at first, you have to get ready to go work, and then realize it is Saturday and you don't? Well, when I first retired every day felt like Saturday so I renamed Monday '1st Saturday', and Tuesday '2nd Saturday', and so forth, because everyday now felt like Saturday. Another thing I love to do is go to Home Depot on '1st Saturday', because it's not nearly as crowded as on 'real Saturday', right? So, there you go.....now you know what '1st Saturday' means! .....the thing I love about this particular Subway is there is a large outdoor area with a plentiful supply of tables with umbrellas for alfresco dining.....this is a kind of food court within an outdoor mall. 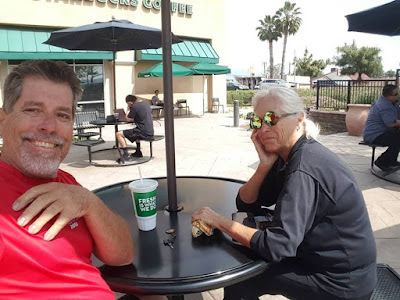 We got our footlong Club and headed outside to enjoy the early afternoon air (we had arrived at just before noon). By the time we finished the breeze had picked up and the air temperature seemed to have cooled, so I donned a long sleeve riding jersey I had put into one of the panniers for just this situation, and we began our 13 mile ride back to Rancho Jurupa Regional Park. There was a little bit of a headwind on the return trip, but we still covered the 26 miles in just over one hour and 45 minutes of riding time averaging 14.2 mph.....my Garmin showed I had burned about 1600 calories! Later in the afternoon we decided to stow the patio awning as the weather guessers were predicting Santa Ana winds in the 30-40 mph range Monday evening through Tuesday afternoon......'they' are right about 50% of the time......better to be proactive about stowing the awning at time of your own choosing, rather than having to get up at 2 am in the morning and do it under duress! Included in the proactive stuff was also putting away all the patio furniture and the tandem. The tandem ride was the centerpiece of our '1st Saturday'........TLE did go shopping at Trader Joe's, but I stayed home and took a nap. We watched the current episode of '24: The Legacy' and were in bed before 11 pm. 7:26 am - PDST - Monday - 54º F, humidity 93%, wind 3 mph from the west southwest......feels CALM.....heavy overcast......seems as if we are getting the traditional 'May/June Gloom' in March.....heavy marine layer in the morning, which burns off by late morning. We haven't been in an RV park for a long time where one could witness the traditional 'Sunday vacuum' empty out the park in an hour, or so, but that is the way it was this Sunday.....one minute the park is full and the next time you turn around there is a line of RV's driving out the park. 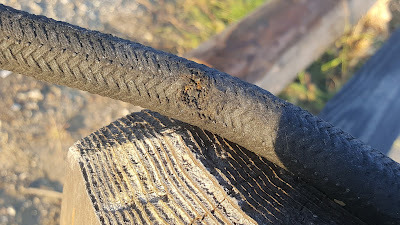 Our kids, those who had stayed over in the park Saturday night, were on their way home early Sunday headed back to their workaday lives, whilst I headed back to the trailer to finish the 'deep cleaning' job I had started Saturday on my Cannondale Bad Boy. Within about 2 hours I had finished and decided I deserved a good ride up the SART (Santa Ana River Trail)......a clean bike just screams 'RIDE ME! ', and who am I to refuse? I got dressed and was out the door within minutes riding the approximately one mile over to the SART trailhead and then 7 fast paced miles north before I did my turn around.......my goal was not miles, but calories.....1,000 to be precise. I haven't ridden my bike since our last day at Tecopa Hot Springs before we descended into the 'Valley of the Wind' (Death Valley) the next day......almost a week. The SART is one of my favorite urban bike trails, and I've put 100's of miles in riding her north and south over a couple of decades. I was back at the coach in just a shade over one hour having eliminated just over 1,000 calories in just over 16 miles. There is nothing like a vigorous ride to release some endorphins into your body chemistry, which in turn lift your spirits, and take the edge off of some the chronic pain your old bones feel nowadays as you continue to pile one year on top of another. It's been a while since we had sufficient broadband to stream Netflix, or Hulu an we had some missed episodic shows to watch so we spent a few hours Sunday evening doing just that.......as TLE remarked about 9 pm.....what a nice day! 7:17 am - PDST - Sunday - 52º F, 92% humidity, wind - CALM.....what a completely different environment we find ourselves in this week! Heavy overcast with a promise of sun by noon time. ......Saturday's temperatures were even lower than Friday's....the high was somewhere around 66, or 67º F with partly cloudy skies.....a perfect day for a hike. On the downhill side I walked with my daughter Kate and we talked and talked......the views, as always, were breathtaking......love the long views. 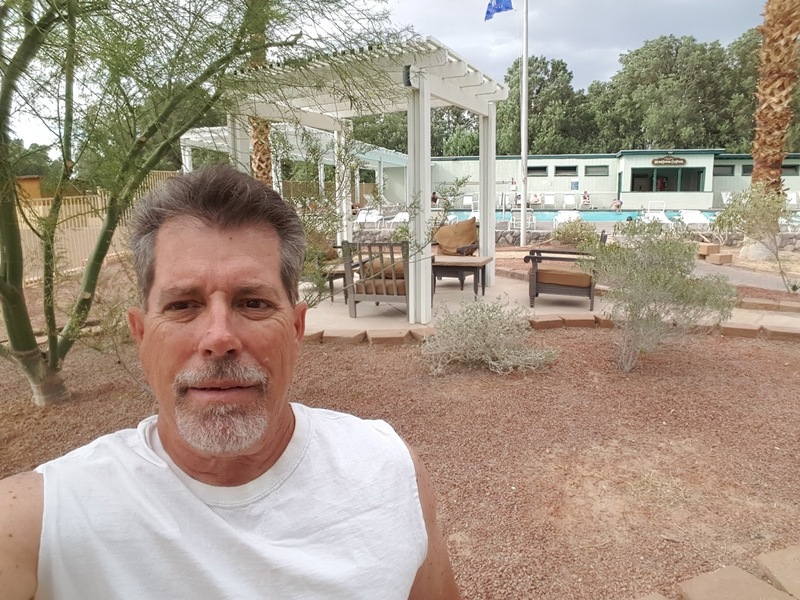 We were back at Rancho Juruapa by 10:30.....Kate and Nick rented one of the park model cabins for the night in preparation for her husband Nick's birthday bash later in the day at Chris and TAR's site. Chris' son Christopher arrived shortly thereafter with my latest batch of mail and packages.....one of the packages contained the new 12 volt electric motor to replace the failed one that powered the large 'attic fan'. I quickly set about transferring the large fan blade from the old motor to the new, and then installed the entire assembly.....it works like a charm and TLE is once again a happy girl......she loves that fan! I also, for the first time in several months, set up my bike stand as it was time to give my Cannondale Bad Boy a deep cleaning. I've put a few hundred road miles on her over the winter and there is a lot of road grime to be cleaned off the crankset, chain and 9 speed cassette......I had just finished cleaning the crankset and reinstalling it when a friend of Chris and TAR's*, Phillip, dropped by to ask me a lot of questions about our full time lifestyle....we ended up talking for about 90 minutes really getting 'into the weeds' on the subject....I suspect we will be talking more over the next few months. By that time it was closing in on 3 pm and I realized it was time to head over to Chris and TAR's* site for the aforementioned birthday festivities, so I got cleaned up and headed over to find the party well under way.....as the afternoon wore on more and more family and relatives arrived including my daughter Meredith, and Tim, my son, accompanied by Laila, his fiance.....we love Laila like one of our children and are so looking forward to her wedding to our son this October. There must have been 30 people there at one time. We had a wonderful birthday celebration, and I spent time moving from one conversation to another. About 9 pm TLE and I called it a day and returned to the Newell for the evening where I promptly fell asleep in my recliner only to be awakened about 11 pm by TLE advising she was going to bed......sigh....time to get up, set up the coffee maker and head off to dreamland once again. 6:12 am - PDST - Saturday - 50º F, 91% humidity (that is like 4 times higher than we've experienced for the last 6 weeks! ), wind - CALM....wait what? No wind? 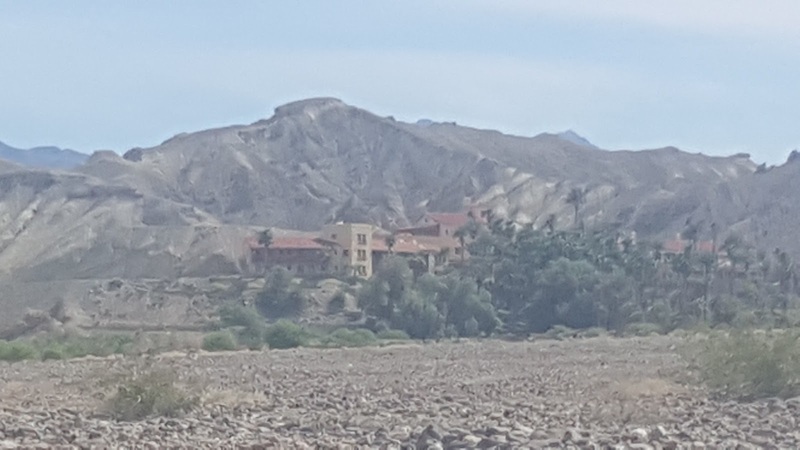 Forecast high for today is 66º F.....something else we have not seen for a few weeks.....we are no longer in the desert! I woke up Friday with the goal of being on the road by 8:30 am and on our way to Riverside, CA where we will spend a week seeing our kids, grandkiddys, and great grandkid. From Baker it is about 146 miles.....a rather long day for us based on the past few weeks don't you think? Just before 7 am it was 47º F, and that was cold enough to turn on a heater to take the chill off the salon. 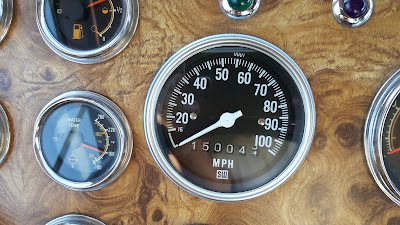 As I was getting ready to fire up the DD I noticed the odometer had just passed 150,000 miles the day before on our way from Death Valley down to Baker.......in reality it should read 158,000+, but the speedo was broken for about a year.......nonetheless it is kind of a cool milestone. When we bought our Newell it had 103,500 miles on the odometer, so we have put over 55,000 on her in just over 9 years. According to Detroit Diesel their Series 92 engines (ours is a 6V92) are not considered broken in until 150,000, and will not need an 'in frame rebuild' until 500,000 miles......I don't think I will still be above ground by the time the odometer reads 500,000. Personally I think our 6V is running better now than it was 9 years ago......she just purrs down the road. When I have my drivers side window open I can hear what I call this 'solid, silky, deep throated roar' emanating from the large chrome exhaust at the rear of the coach.....very reassuring. A Detroit 2 stroke engine has a unique sound which is easily differentiated from a 4 stroke such as a Cummins or Cat, and no matter where I may be, or what I may doing when I hear that sound I am compelled to look up to find out where that two stroke sound is coming from. Thank you for bearing with my digression.....anyway, we were, indeed, on the road by 8:28 am and 'running like a horse for the barn' towards Riverside, CA on I-15 westbound. This is most time we have spent on an Interstate in over 2 months, and I did not miss it one single bit....we love those secondary roads! Our goal when we are rolling our wheels is to strive to use the term 'uneventful' at the end of the day when describing our drive, and that is exactly what we got.....all I did was set the cruise control, hold on to the steering wheel and enjoy the ride as we seemingly floated down the road mile after mile. .......thankfully she waited for us at the top for our 'summit usie'......in all we covered 3.3 miles in about 52 minutes......TLE and TAR* beat Chris and I back to the car by a couple hundred yards, but that was okay because I got to spend time talking with my son, and that is something I miss every day we are on the road.....sometimes I can't believe I am the father of such a cool guy who, though will always be my son, feels more every time I am with him like a very, very good friend whom I have known literally for 44 years. Our Beetle's interior and exterior have been neglected for several months now, and after all that time of desert living was filthy inside and out.....and in addition to that her gas tank was strongly hinting that more fuel needed to be added soon, or I might find myself hitchhiking to the nearest gas station. After getting home and doing a little more setup I got in the VW and drove over to the local ARCO station where I took on 12 gallons of 92 octane gas at $2.99/gallon....yup back in SoCal where all grades of fuel are at least 50 cents more than Arizona, or Nevada. On the way back down Mission Blvd. I stopped in at a small 'mom and pop' car wash I had been passing for years and had the Beetle hand washed, and the interior given a deep vacuuming.......she is smiling again.....all for the low cost of $14, which included tire dressing! 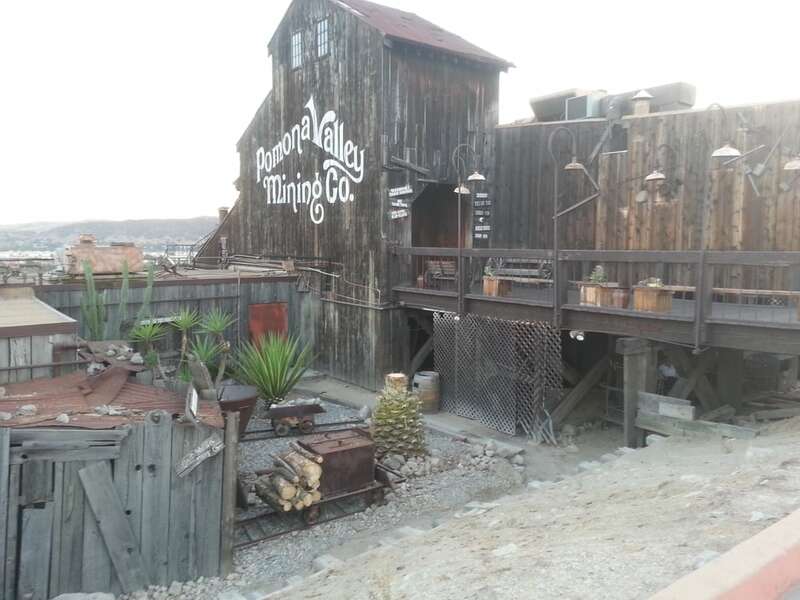 I was back 'home' by 3 pm and did a little more setting up before taking a shower, and getting ready to go drive out to Pomona to meet my brother Philip and his wife Jeannie for dinner at our favorite restaurant, the Pomona Valley Mining Company, which is perched on the side of a hill high above I-10 just a few blocks from the L.A. County Fairgrounds. As we always do, we had a lovely conversation and the time just melted away. An interesting fact.....my brother Philip is 14 years younger than I and is closer in age to my son Chris than he is to me.....Chris is only 8 years younger than Philip, and they have been good friends since they were both young. You can see I-10 way down below! TLE and I were home just after 10 pm.....a whirlwind first day back in SoCal.....Saturday will be another whirlwind of familia activities....stay tuned! As I sit here at the end of today's blog I can't help but reminisce how just over six years ago (February 1, 2011) TLE and I drove into Rancho Jurupa Regional Park in our 1982 Newell to spend one year as camp hosts. We had just signed a 12 month lease with two of our children and two of their friends on our home, so we could live in the Newell together for a year before we hit the road.....TLE wanted that time to be sure she could live with me in a small space......as one might correctly surmise, I passed the test. 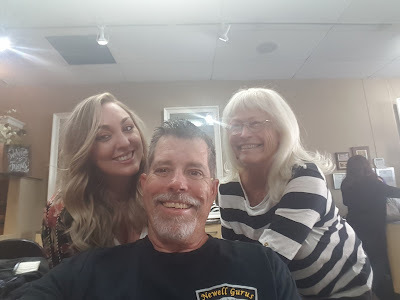 We left Rancho Jurupa exactly one year to the day and have been living full time on the road for over 5 years now.......seems like yesterday to me......what a wonderful life we have! You will notice a new link at the very top of each daily blog post, and one just above the 'Page View' counter to the right of my blog....."Our Amazon Affiliate Link".....if you do shop Amazon please use my link when you do, and I will receive a portion of any purchase you complete. If you are viewing my blog on your phone, or by email you will not see the link, it is currently only visible on the 'web version' of my blog. 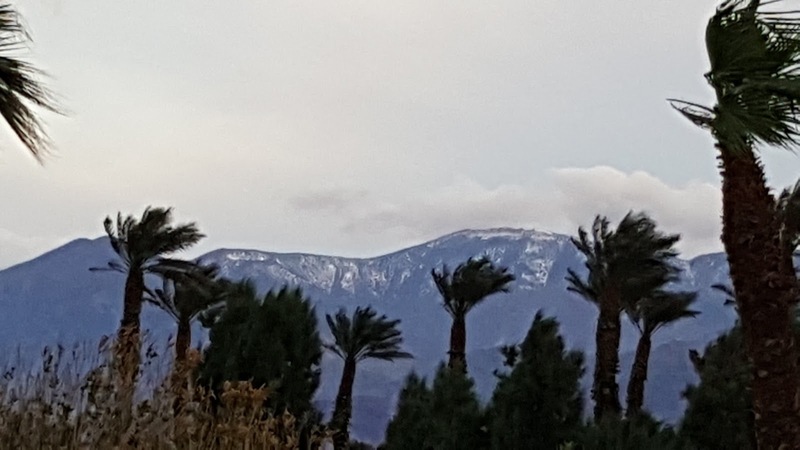 6:53 am - PDST - Friday - 47º F, humidity 51%, wind 3 mph out of the southeast.....clear blue skies from horizon to horizon......moving day once again.....we will be leaving for Riverside in 90 minutes! I was up well before TLE Thursday morning typing my latest missive, and then moving a couple of things in the trailer in preparation for VW insertion. 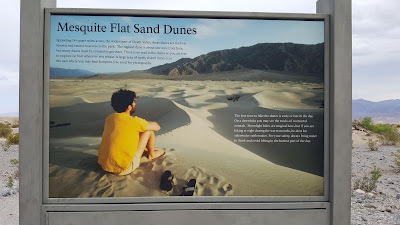 Our Jello plan was to be on the road making the 20 mile climb out of Death Valley aka: Valley of the Wind by 9 am. 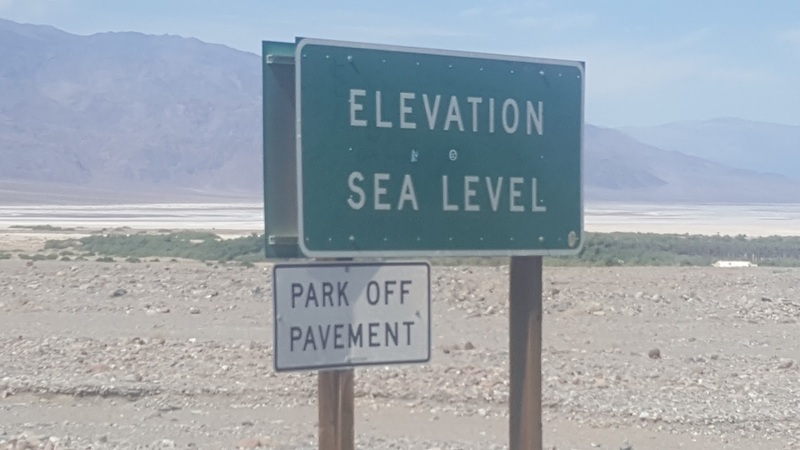 Our elevation at Furnace Creek was about -180' below sea level.....the elevation at the summit 20 miles distant was +3,100' elevation......3,280' of elevation gain in a shade less than 20 miles. Best to do that kind of climbing while there is still coolness in the air. By 8 am we had the VW in the trailer and were ready to roll, and so we did.....just about 200 feet over to the dump station to dump both tanks (always like to arrive at a destination whenever possible with empty tanks) and take on fresh water (again, always like to top of the fresh water tank whenever possible).....ironically, in one the lowest places in the Western Hemisphere the water quality at Furnace Creek is quite good. By 8:40 am we were finished and merging on to SR-190.....the climb begins immediately outside Sunset Campground and I settled quickly into 3rd gear at about 2000 rpm's for our 20 mile climb to 3,100' elevation. Red line on the Detroit Diesel Series 92 engine is 2,100 rpm's.....by keeping her at 2,000 rpm's the enormous belt driven fan forces a greater volume of air across the cooling fins of the larger than life rear facing radiator thereby keeping our operating temperature around 195º F for the entire climb. 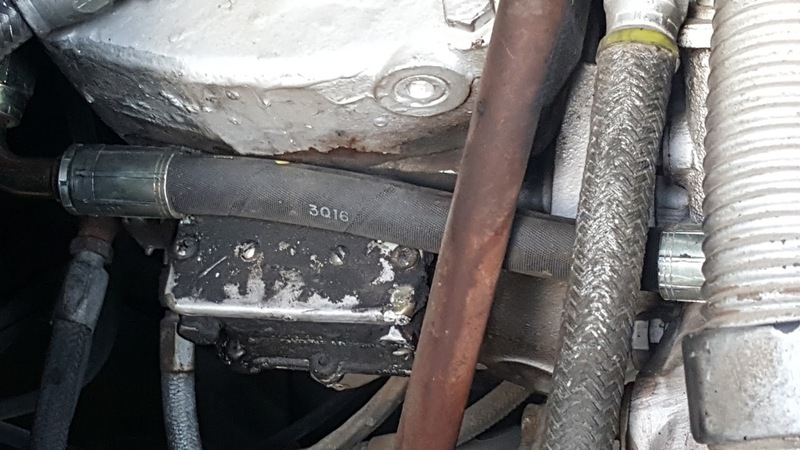 You do not want to 'lug' up a long climb at low rpm's with a series 71, or 92, because they will quickly overheat, and if the temp gets over 250º F you will suffer, most likely, catastrophic engine failure. We reached the summit without incident, and I quickly upshifted into 5th gear, and set the cruise control at 60 mph.....we stopped in Shoshone around 9:50 am to take a brief potty break, and were back on our way shortly after 10 am for the final 57 miles into Baker, CA, our destination for the day. 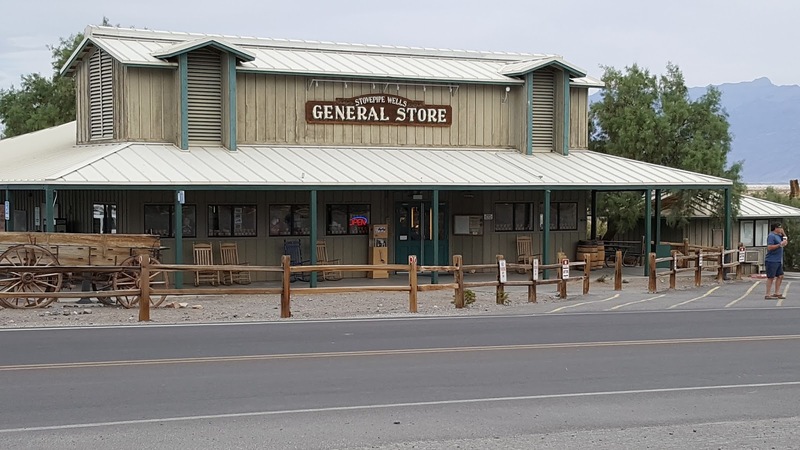 Why Baker, CA you might wonder....well, two of our nomadic friends, Steve and Candy, would be there for two days preparing for the annual 'The Challenge Cup, Baker to Vegas Relay' as volunteers, along with Ron and Karen (Ron is the Fontana/Rialto Elks Lodge exalted leader). 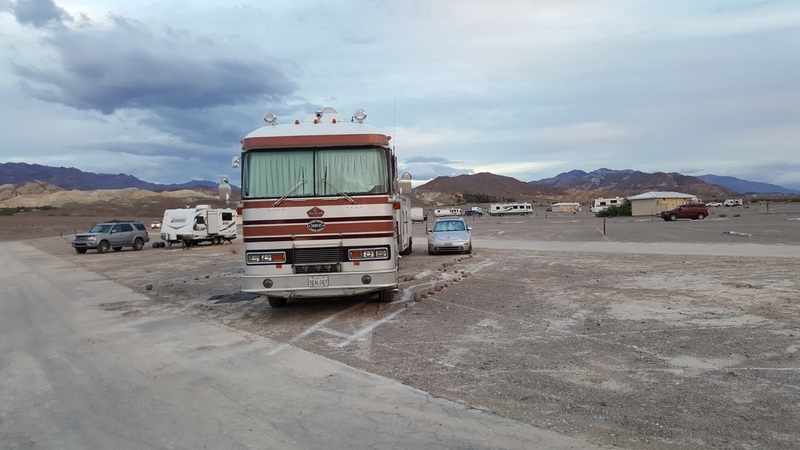 We were invited to stay with them at the Baker High School grounds.....below is a picture of all the RV's already there when we arrived.....Steve and Candy's RV is just on the other side of our Newell. By noon time we were parked, and I was receiving one phone call after another....mostly about this summer at TVC from prospective employees, and from Victor, our assistant manager. By 1:30 pm I was finished with phone calls and went outside to greet our hosts and talk for a while. Around 4 pm I excused myself to go inside and watch some more 'March Madness'....first up was Michigan vs. Oregon, but about 4:45 pm I had to pry myself away from the TV for the evening's potluck dinner sponsored by the race events organziers. We had a lovely time talking and eating until after 6 pm when we headed back to our respective domiciles for the evening. I caught the very end of the Oregon game in which Oregon barely prevailed 69-68. Next up was West Virginia vs. Gonzaga and once again Gonzaga barely survied 61-58....the game could have gone either way. Kansas creamed Purdue by 32 points.....boring....and in the fourth game favored Arizona was upset by Xavier 73-71.....so 3 of the 4 games were 'squeakers'.......very interesting games right down to the last second....looking forward to Friday's matchups! 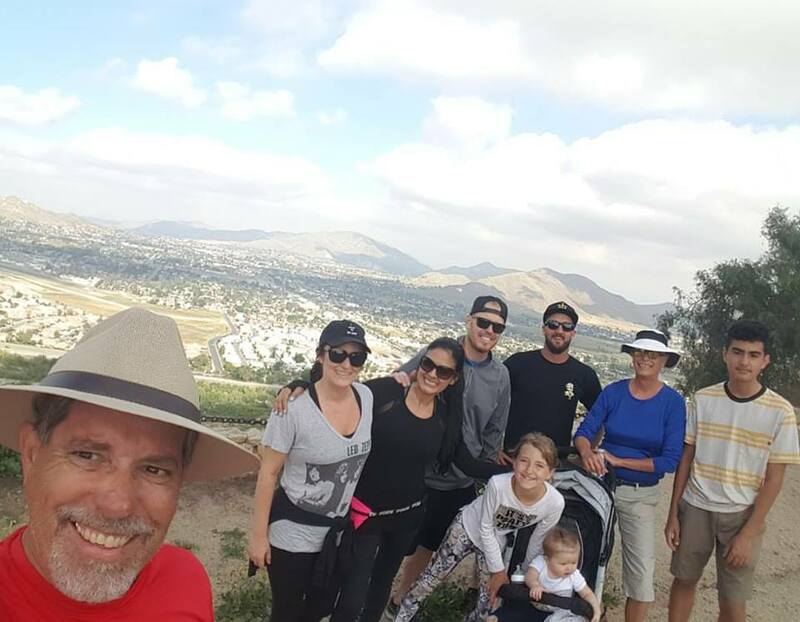 We were in bed by 10 pm and already thinking about a week with our kids and grand kiddies....thanks for stopping by! 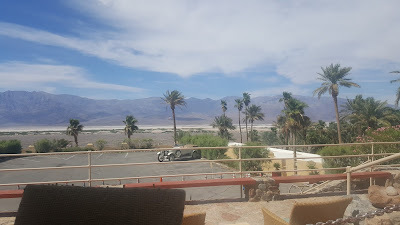 11:36 am - PDST - Thursday - 64º F, 31% humidity, wind 6 mph out of the west........partly cloudy skies.....we made it from Furnace Creek to Baker, CA in just 2.5 hours......wonderful drive today! 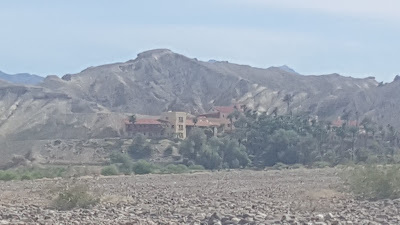 The forecast high in Baker today will be 77º F.....we are definitely, finally in a cooling trend.....the forecast temps in the Riverside, CA area where we will be for a week beginning Friday are in the 60's and 70's......and no wind forecast......wonderful! Of course, the day we leave Death Valley aka: 'The Valley of the Wind', the wind finally dies for the first time in 4 days. After 3 days of continuous winds in the teens TLE succumbed to her allergies......I closed all the windows first thing Wednesday, and turned on A/C to the low fan setting to hopefully filter all the dust and pollen out of our interior air, and that seemed to help, but by that time she had a sinus headache to beat the band, and spent a large part of the morning in the darkened bedroom with a pillow over her eyes. Regrettably that ended our site seeing plans for the day......I got a chair out and sat outside in the sun reading for a couple hours in the still cool early morning air. That was pretty much my day Wednesday, other than checking on TLE periodically to be sure she had not succumbed to anaphylactic shock.....she did not. By early afternoon she was beginning to feel slightly better and joined me in the salon. Later in the afternoon I busied myself with putting away what little stuff we had deployed, which was not much, in preparation for our liftoff early Thursday morning. 6:55 am - PDST - Wednesday - 64º F, humidity 47%, wind 8 mph out of the south southeast........change is good! Forecast high is 79º F.....now that is change I can really get behind! The wind died about 5 am, but it was a good night of sleep! As I was sitting in my recliner reading Tuesday night a song by the Doors, Light My Fire, came on Sirius/XM Radio's Classic Vinyl channel.......and these words described perfectly the mental process I had just been through......"The time to hesitate is through.....no time to wallow in the mire....try now we can only lose....".......it's been a long time since I was so unhappy with a location that I wanted to leave the minute I arrived.....it's been a long time since I forgot to live in the moment......it's been a long time since I failed to look for Miss Serendipity in a situation, but that is what happened to me when we arrived in Furnace Creek late Monday morning. It was hot, windy and miserable......I hated all the campground options, and all I could talk about for the first 24 hours was leaving first thing Tuesday for a better location and better weather......I sat around stewing in my juices all day Monday.....I 'wallowed in the mire' so to speak........all day, into the night and early morning Tuesday before I decided 'the time to hesitate is through'......what have I got to lose? ....a 'Hawking Dish' is essentially a USB directional WiFi dish antenna designed to inexpensively magnify a WiFi signal from a distance and can magnify the signal by up to 300%. 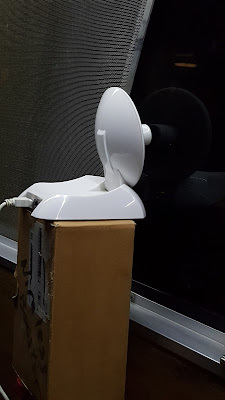 Without the 'Hawking Dish' plugged into one of my USB ports I cannot even detect one WiFi signal, but with it I can pick up no less than 7 including the aforementioned open hot spot. Using my 'Hawking Dish' enables me to continue writing my daily blog posts without having to walk across the street. The second thing that brightened my outlook was less wind, and slightly lower temperatures.....at any rate, once the blog was up TLE and I hopped in the Beetle for a 20 mile drive over and up to Stovepipe Wells......I say 'up to' as Stovepipe Wells as it is at Sea Level, and we are 100'+ below Sea Level at Furnace Creek. We arrived there in about 20 minutes......our intent was to check out their 14 full hookup sites......years ago (probably about 11) we stayed in one of those sites when we had our 1986 Fleetwood Tioga Class C motorhome....at that time these sites were 'first come, first served'. There were several sites available, it appeared, but upon checking with the nice lady at the Registration Desk we found out they are now reservable, and that all 14 sites were reserved for Tuesday. ......the parking lot was already full this day, and many folks were taking the hike out to the highest dune (see it in the background). 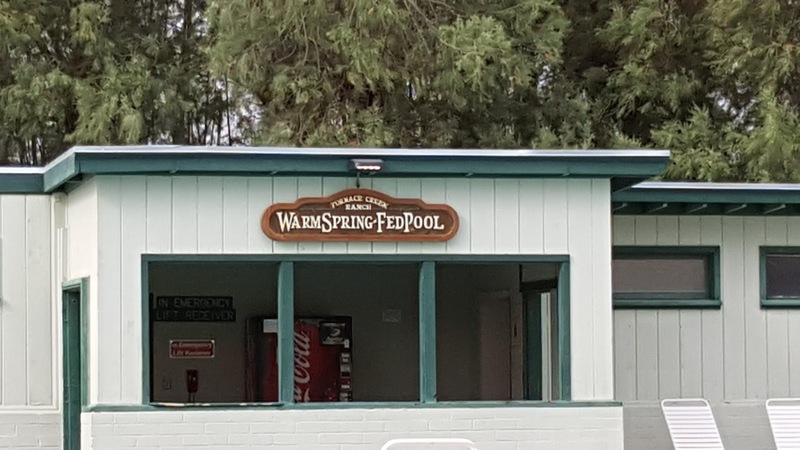 Upon return to Furnace Creek we drove into the resort to see what was there and found there was a large warm spring fed pool there. 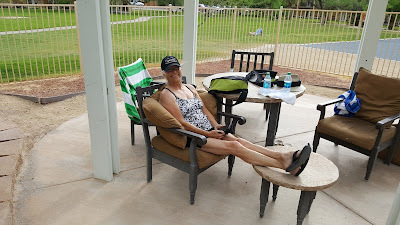 I decided to go into the office to see if one could buy a day pass to the pool and was advised one could do such a thing for the small charge of $5 so I bought passes for TLE and I to be used later in the day when it got warmer. 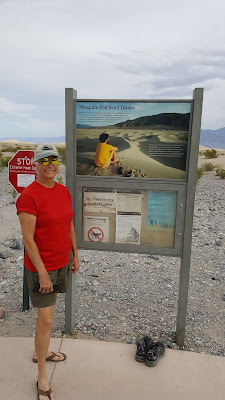 7:11 am - PDST - Tuesday - 69º F, humdity 35%, wind 7 mph out of the south southeast-----very, very windy most of yesterday, and all night long.....very hot yesterday....over 90º F.....not sure if we are going to stay another day in Death Valley.....forecast orginally was for 80º F today, but has changed to 88º F with high winds.....not a formula for a lot of outdoor fun. 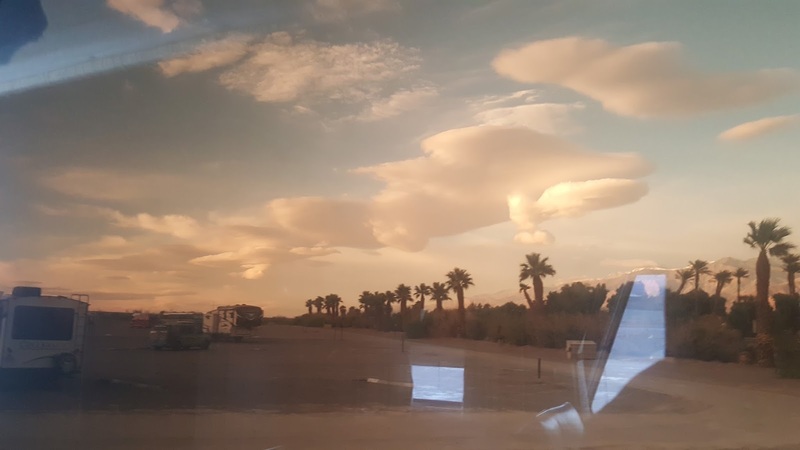 I was able to connect to the Furnace Creek Guest WiFi across the street using my 'Hawking Dish'.....costs $4.95/hour so I've got to get this done quickly. 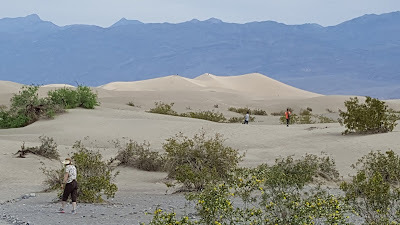 We were up and at them early Monday in anticipation of leaving before 9 am and driving 66 miles into Death Valley, specifically to Furnace Creek where there are a number of campgrounds. There was very little traffic as we merged our 62' on to SR-127 north towards Death Valley Junction where we would turn left on SR-190 and begin the 30 mile plunge into sub sea level elevations. 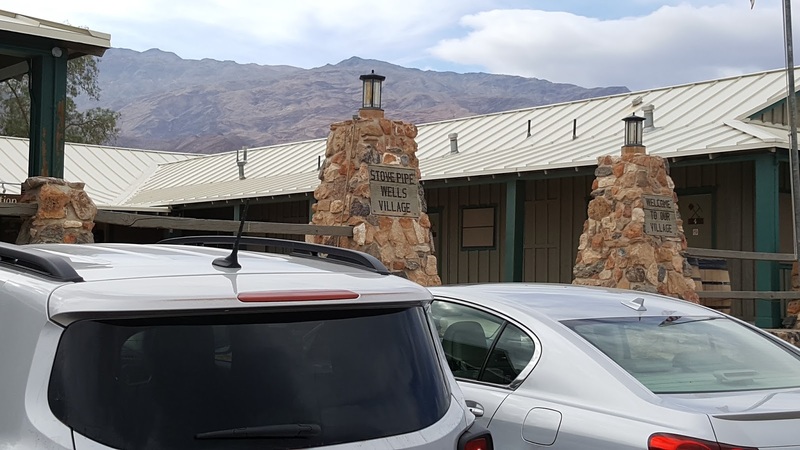 In all it took just over 80 minutes of driving to reach Furnace Creek which sits just over 100' below sea level. We parked directly across from Furnace Creek Ranch to figure out in which of the four campgrounds we wished to spend the next 3 days. We settled on the one we were parked directly across from.....Sunset Campground. This is basically a large dirt lot with sites marked off with white chalk.....most are back in sites, but there are two rows of pull throughs that are about 70' long, and we ended up on the very back row (M) in site 10 facing west northwest.....not the best angle for our solar panels, but passable. As we began to set up we noticed the wind picking up, which is not an altogether bad thing when it is going to be quite warm. Unfortunately, that wind kept increasing in velocity all afternoon until it was consistently in the 30's with gusts into the 40's. That wouldn't have been so bad, but the wind was coming basically from our rear which meant we were not getting much breeze inside to keep it cool, so we ultimately turned on the big propane generator and ran the rear A/C all afternoon. We did drive over to the Inn at Furnace Creek to see if we could get dinner reservations, but the earliest time they had available was 8:15 pm, which is later than we like to eat by a long shot, so we decided to return about 6 pm and just order a bottle wine an a couple of apps in the bar area. .....after our short visit to the Inn we returned our campsite then walked across the street to get our entrance pass.....all National Parks have an entry fee to obtain an entrance pass.....with our Senior Pass that fee is waived, an the campground fees are discounted 50%.....so, we saved the $25 entrance fee and only paid $7/day for our campsite.....a $46 dollar savings. ....there was some sort of vintage car rally staying overnight at the Inn, and these were their cars out in the parking lot. On a side note....thank you to all those who have shopped Amazon using our affiliate link....it is appreciated! "Break on through to the other side!"